If you live in Calgary or near by then now you have the possibility to learn Reiki at home online, but receive the attunements directly through me here in Calgary. We welcome you to our Reiki Calgary level 2 course. My name is Daniela. And I’m so honoured to tech this course together with my daughter Lina. Let’s have a moment of reflection. The First degree… You have learned the basic knowledge of Reiki, and the basic hands on healing methods. You have been initiated into Reiki by means of attunements, that will empower you to become a Reiki channel. From this time on Reiki energy will flow through your hands. It means you are now a Reiki practitioner the rest of your life. We believe that Reiki Level one has opened up new doors in your life. That is why you want to move one to your Reiki Calgary: Level 2. 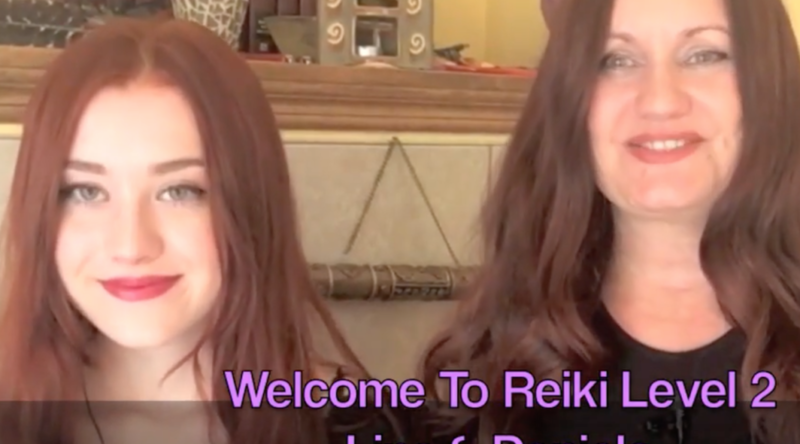 Every one will have a different experience with Reiki, and I’m sure that Reiki will change your life for the better; if you are open to receive, and allow healing to take place on an physical, emotional, mental, and spiritual level. If you want to get the attunements for the second degree you must first already have the first degree completed, including the attunements. Also wait at least 21 days after your Reiki level 1 attunements. Practise a lot, and listen to your heart to know if it is the right time to move on. In this Reiki Calgary course, you will learn how to active the Reiki Symbols, how to protect yourself. How to do a spiritual room cleansing with the Reiki symbols. With this Reiki Calgary course you will learn how to do a distance spiritual room cleaning. We will practise distance healing, healing the past, healing of the inner child, mental and emotional healing too. You will learn in this Reiki Calgary course, how to create a healing depot, and how to program crystals and stones. And you will learn how to send positive energy to the future. At Reiki Calgary you will learn how to install a reiki shower as well. And how to work with a Reiki box.